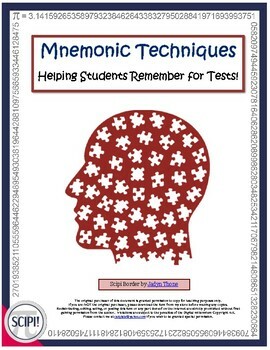 This free resource lists several different mnemonic devices that will assist students in remembering and recalling larger pieces of information for tests. Included are acronyms, initialism, acrostics, rhyme, rhythm and song and association in addition to visualization using the loci and peg systems. Definitions for each mnemonic method are provided under each category as well as specific mnemonic examples for math, science and language arts.